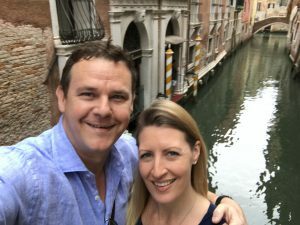 Ok, let’s continue where I left off with my Cruise Travel Blog – One week already, part 2… If you missed part one, you can jump back to it here. I’d heard mixed reviews from friends who have recently visited Tallinn. One couple told me that you may as well stay on the ship because its really quite non-descript, so I didn’t have the highest of expectations for this city which I’d been keen to visit for many years. Beven had a busy start to the day, so although there is a complimentary shuttle bus into the main town, we just missed it, and decided to walk. It’s actually an easy and fairly short walk, out through the main port area and then following the road up to the park and cross over towards Fat Margaret and the Coastal Gate. 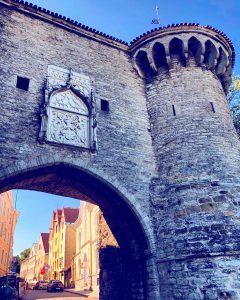 These are iconic buildings in Tallinn and you really can’t miss them, so if you go through the gate, you’re into the Old Town which is exactly where you want to start your explorations. Fat Margaret is rumoured to be named after one of the cooks in this old building, and the Coastal Gate was built both to secure the town from the port, but also to impress its visitors. It was built in the 1300s and is one of the two remaining gates of the six gate security system. Tallinn is a walled city with cobblestone lane ways opening into beautiful piazza-style squares. There are cafes and bars everywhere, and each corner you turn provides a new photo opportunity. It really is quite an impressive town and has become one of my favourite Baltic cities. We stopped at the ‘Wine Library’ in the main square to enjoy a glass of Chianti and an antipasti platter whilst soaking in the surroundings. After a few hours, we walked back to the ship, taking some photos of the many other ships in port with us. We look really small next to them! Drinks in Torshavn to celebrate his show! St Petersburg is another city I’ve wanted to visit for many years. When I worked for Royal Caribbean in the UK (from 2007), we received a complimentary Familiarization cruise after 12 months of service and I promised my family that I would take them with me. I put in the requests for several cruises; Alaska, the Baltic and the Med. Alaska I knew was a long shot, and no surprise, didn’t come through – its always sold out. The Baltic was a tight one…and they came through with one cabin, I couldn’t get a second. Whilst my sister and I would have had a ball, I had made the promise for my parents to join, so I took the Med cruise which was easier to get the two cabins on, and we had a fantastic time…but it meant I was continuing to long for a cruise to the Baltic for many years after. So finally, here we are, two days in St Petersburg. 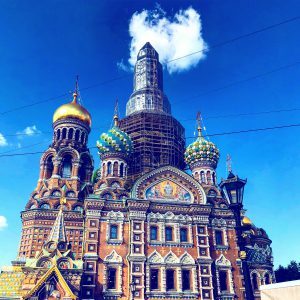 As you may or may not be aware, getting visas for Russia for the majority of nationalities is really not easy…unless you do a ship-hosted shore excursion. Whilst I can do these any time, its harder for Beven to confirm excursions as they generally require him to be away from the ship longer than is feasible. 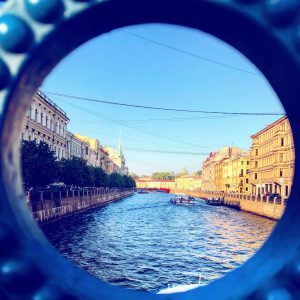 However, knowing how keen I was to see this city, he had arranged (before I even got to the ship) for us to do a five-hour excursion, taking in St Isaacs Church, the Church of the Saviour on Spilled Blood and then a river cruise down the beautiful canal ways to take in the stunning buildings. It was a fantastic way to see the city, particularly with our tour bus taking us around several other sights to give us a real feel for the place. What surprised me the most is the size of the buildings and the grandeur of them. Every European country has its share of palaces and state buildings, but they’re usually interspersed with more ‘normal’ buildings. In St Petersburg, its literally palace after palace. They are the masters of communal living, families all sharing one sleeping room and then sharing the kitchens and bathrooms, and I guess this explains why – no one could afford such a huge house to themselves! I hadn’t thought of Russia having such pretty canals either, its another city which reminded me of Venice – it just needs a few gondolas! We returned to the ship for dinner and had an early night. When the ship overnights, there are no production shows as most guests are on excursions, although we did see some of the Marinski singers, a local group who perform opera for the guests remaining on the ship for the evening. 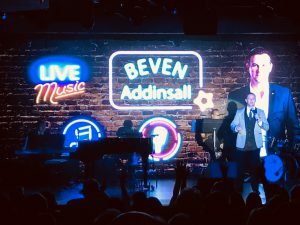 All guest entertainers have to be introduced and taken off by Beven, which also allows him to remind the guests of what is coming up the following day, and if the clocks are changing or any other important information. The second day in St Petersburg was basically a ‘sea day’ for us, with no excursions to allow us off the ship. Time to sit back, relax and catch up on some work and gym time! I’m not sure that I really had any expectations for Helsinki. I don’t know of anyone who has been to have heard any stories and I guess I just think of it being really cold with locals walking around in long coats and fur hats. With it currently being summer, that was an unlikely scene! Tonight was the Captain’s Farewell Party in the Star Theatre. It’s done today as the next night is an overnight so guests are off the ship. 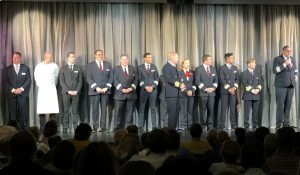 This show involves the Production Cast again, Beven, Captain Lars and the Senior Officers, plus many the crew who are introduced into the room to say thank you to the guests, and for the guests to say thank you for their service. It was a really nice event with a video which works through each department, with the subsequent crew waving farewell. Today is an overnight for the current guests and then they depart, followed by an overnight for the new guests, so a total of 2 nights in this city. Yet another city I have wanted to visit for a long time, and one I have heard a lot about, but mostly how incredibly expensive it is. 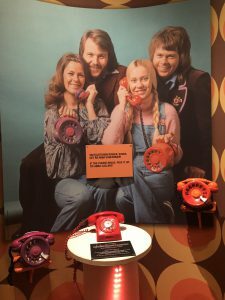 The Production Cast all arranged to have the day free in order for us to all go visit the ABBA museum. 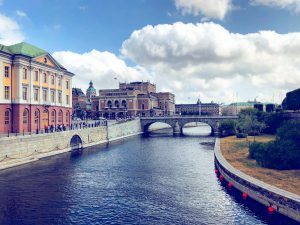 It was a 15-20 minute walk to the ferry station, where we bought a group ticket and boarded the small, rather basic, ferry across to Allmanna Grand stop, on the Djurgarden line from Slussen. On the way to the museum, Jamie booked the tickets online so that we could skip the queue and head straight in and we met up with Kerrianne, the fourth member of the production cast when we got there. The museum was great and very interactive, allowing visitors to mix songs and be graded as to how well you did, sing in a booth (imagine five amazing voices all singing Dancing Queen…then walking out to a huge round of applause from other visitors! Obviously, I just mimed, I wasn’t going to ruin their harmonies with my cat wailing! ), singing on a stage with virtual ABBA members around you and lots of quizzes on screens. There as a room filled with their bright, unique costumes, all of their LP covers, their recording studio and head office… You could easily spend several hours here. 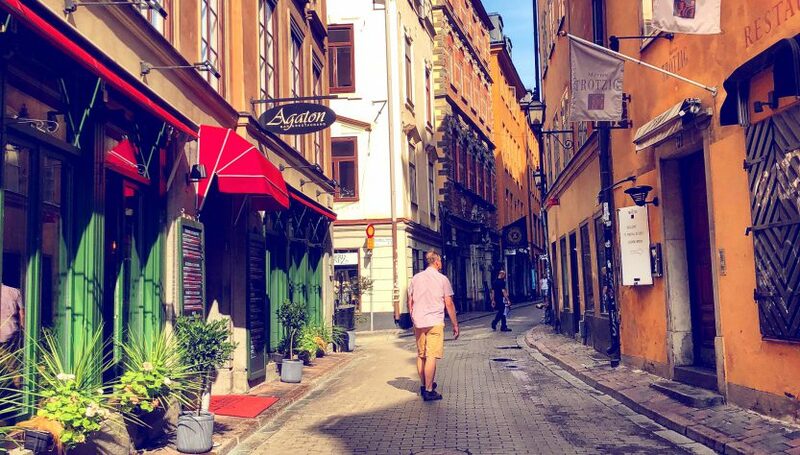 As usual, we were on a fairly tight time restriction, so headed off after a couple of hours to go into the Old Town of Stockholm to get some lunch. What an incredibly beautiful town this is! 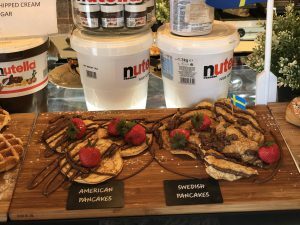 We wandered down cute little cobbled lane ways, lined with gift shops, cafes and waffle shops – they seem to be obsessed with waffles! They have the hot irons in the windows of many of the shops and the sweet smell fills the streets – delicious. We came across what looked to be a little Italy, with several restaurants next to each other, displaying bright flower tubs outside the windows and with red and white checked table cloths inside. We chose one with a specials board which didn’t look too horrendously expensive and took a seat in the window, opposite a cute gift shop and ordered a Bellini and a beer to start. 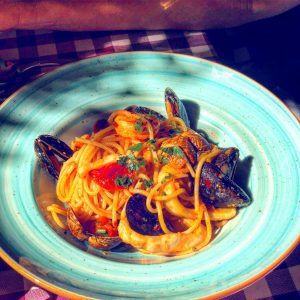 We then shared a buffalo mozzarella salad – OMG, the best buffalo mozzarella I think I’ve ever tasted – followed by a seafood pasta for Beven and a tomato and eggplant pasta for me. Both were sensational, you know the kind of meal you eat which you enjoy so much that you don’t want it to end? Yep, that was it. We walked back to the ship afterwards for Beven to go back to work and for me to hit the laptop. Tonight being the guests’ last night, the Entertainment Team put on a dance pool party under the stars. This was the first time they had done it up on the pool deck, its usually held in the Atrium, but worked really well and had many guests up dancing along with the team. Not a bad way to end a fabulous cruise for them! Second day here, Beven had a crazy morning so we missed breakfast on board and decided to go get food in the Old Town. I guess we forget how lucky we are in Australia to be such a foodie nation and one which loves its breakfasts and organic cafes. This didn’t seem to be the case in Stockholm. We passed lots of closed bars, cafes and waffle shops, went into a few little coffee shops which literally just sold coffee and not much else, until we finally came across a pretty little cafe/cake shop which said it did bacon and eggs. Perfect. We entered the little venue (which was a little too hot) and were instantly hit by rows of nutella jars, doughnuts, cinnamon buns, cakes and every other calorific and chocolate laden cake you can imagine! We ordered an omelette with extra bacon and scrambled eggs with bacon and two chai lattes and took a seat close to the door and air conditioning unit, which wasn’t very effective. The chais were good, but very sweet. The food arrived, a plain egg omlette with lettuce and scrambled eggs with lettuce. Hmm…not exactly what we were expecting. We called the waitress over and requested the bacon and cutlery, were told that the cutlery was self-service in the other room, and that the omlette had bacon inside but they’d get some for the scrambled eggs. Oh, and this had cost us about AU$60… My meal returned, with the bacon, and was actually quite tasty. Beven’s definitely didn’t have bacon so we had to get this brought over separately. We finished eating and headed back to the ship, figuring Stockholm certainly wasn’t a breakfast kinda city! Later that day, we went back into the town with a group of the crew for drinks. It was great to see the city at night and also wander a little further north of Gamla Stan. The buildings are really beautiful and the bridges lit up so romantically! We went from a packed little Irish bar with a live band onto a more modern bar, sat at long tables in a classy surrounding. This is not a cheap city as mentioned before, so it was never going to be a big night when paying so much for a gin & tonic…so after a couple of drinks we headed back to the ship, leaving the younger guys to continue to party into the small hours! What an incredible week its been. I feel really settled into our cabin, have got to know a lot of the team and think they’re awesome, and no longer get lost when walking from one end of the ship to another! The next cruise will be the first full one I do, fourteen nights, starting in Stockholm and ending in Bergen. Bring it on!